I’m happy to report that the house we’ve been working on all summer is finished and on the market! Hooray! G bought the place in 2005, a few weeks before we started dating. We lived there together for a few years after we got married in 2008. So technically we aren’t really house flippers, but I like the idea of an All Things New Again House Flipping Show on HGTV. My Mom and Dad would be the stars of the show, of course, because they are hilarious. They are also the ones who came up with the great ideas and drove an hour+ to Alexandria pretty much every day this summer to work so hard and help us out. Joey would be the special guest star since he was right there with us helping out every day like a rock star. He’s also the only kid I know who asked for a tool belt for his 3rd birthday present. 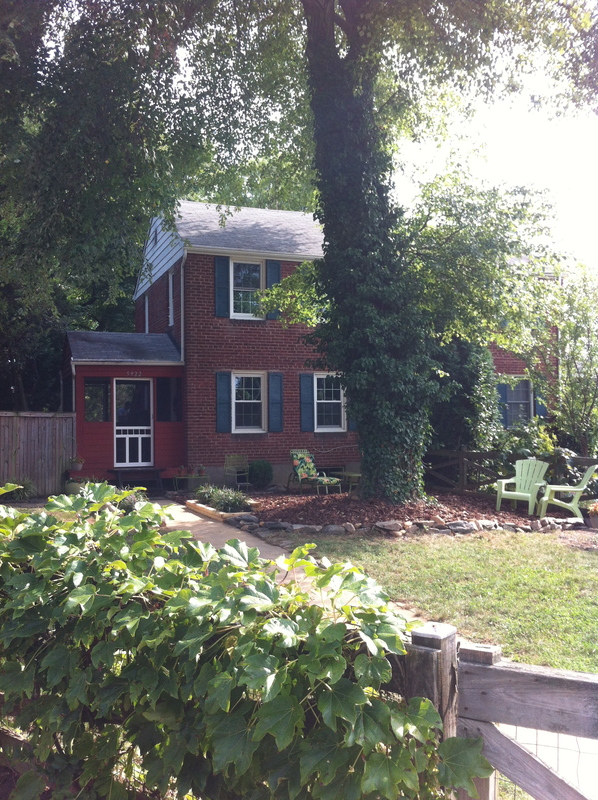 Here’ s the best “before” shot of our house I could find. There it is on the left buried underneath a few feet of snow after the big Snowmaggedon storm in February 2010. We moved to our new home a few weeks later and have been renting out the Alexandria place ever since. When our last tenant moved out-of-state at the end of June, G and I decided it was time to sell. Hooray for the real estate market picking up! We are very fortunate that all of our tenants over the years have been really nice people who took good care of the house. Still, it needed some work to get it ready to put on the market so we called a contractor for an estimate. The next day I met my parents at the house with a bucket of Simple Green and a few gallons of paint. We finished painting the guest room the first day and thought: This isn’t so bad! (Well, we ARE awesome painters!) My dad also fixed the rickety porch steps in less than an hour with wood he had stashed in his garage. Total cost: $0. Woo hoo! We were on a roll! Who needs a contractor when you have my parents? Come on inside and take a look around. Our biggest splurge was on the floors. This wasn’t on our original to-do list until the contractor suggested we re-do them. He was right. The hardwood floors are original to the house, which was built in 1949. They needed to be sanded and restained. We debated renting a machine and doing the work ourselves, but decided it would be best to hire a flooring company. Wowza! That expense was worth it! I wish I had a “before” picture to show you the badly scratched-up places and how the wood grain had disappeared from six decades of use. The floors are absolutely stunning now. Why didn’t we do this years ago so WE could enjoy them? 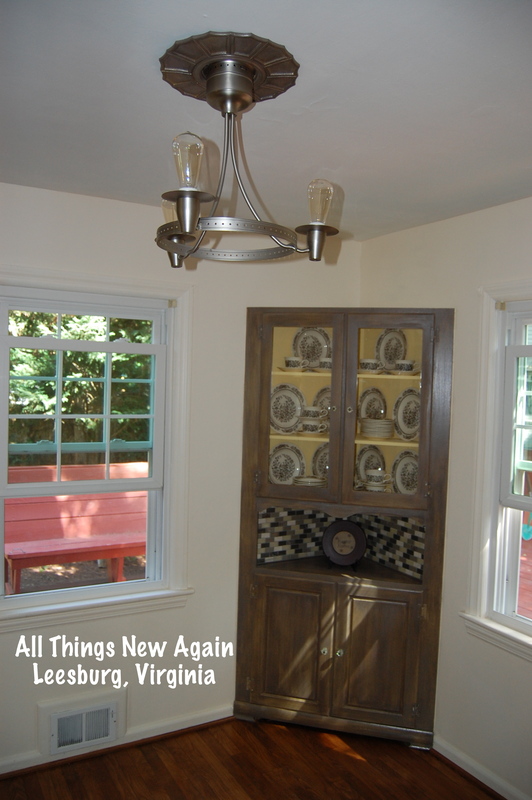 Here’s the link to how I transformed the built-in corner china cabinet and the link to how I up cycled the existing chandelier using a $14.98 ceiling medallion from the hardware store and $30 worth of Edison light bulbs. These were inexpensive updates, but I think they add a lot of value to the house and make it special. The kitchen really showed the home’s age. Again, I don’t have a good “before” shot because we weren’t planning on a major re-do at first. We were just going to paint over the barn red from a previous tenant. (We told her it was OK!) Then we got the idea for the backsplash … which led to painting the cabinets … which simultaneously updated the space while accentuating its best vintage features. I think this space is actually much cuter in person than these pictures convey. We kept all of the existing cabinets. The upper cabinet (in the photo above) is original to the house and had been painted white B.G (That’s Before G!) He refreshed all of the white cabinets when he moved in and added the bottom white cabinet from Ikea along with a butcher block counter to match the original wood countertop on the other side of the kitchen (see photo below). We decided to leave the Ikea cabinet white for a little modern pop. My dad installed the backsplash. We scrubbed both countertops like crazy and brushed on a special food-grade oil to refresh the wood and make it look pretty again. The cabinets were base coated with a color called Manila from Behr, which is the same yellow color we painted the door and window frame. Then we added a color called Crushed Tea from American Paint Company and distressed for a unique vintage/rustic look and sealed with several coats of Minwax Polycrylic. Here’s another view. We painted the kitchen walls a color called Hopsack from Valspar and kept the nice open shelving that G previously installed. That’s a new-ish faucet, but the original sink and cabinetry from 1949! Since the kitchen is small, we purchased smaller-scale appliances when we replaced the stove and refrigerator a few years ago. You may recognize our window treatment from the shop. That’s my mom’s signature look: a vintage apron hanging from a tree branch turned curtain rod. It works perfectly here! This message board was a quick–and almost free!–project that added another special little touch to the kitchen. My dad cut pallet wood leftover last summer’s shop renovation to create the frame. The pallets weathered so nicely from sitting outside all year that we decided not to paint it. I painted the chalkboard directly onto the wall using three coats of American Paint Company’s black color called Lincoln’s Hat. To prepare the chalkboard for writing on it, just turn a piece of chalk on its side and rub it all over, then wipe it off. I already had the paint and the chalk. The only cost was for the chalk holder. We used a drawer pull flipped upside down at a cost of $5—an idea I saw online. We didn’t do much here, but give it a fresh coat of paint and add pretty hand towels and a new shower curtain. Most of the bathroom is original to the home. I like it. I think the vintage black and white (with just a splash of pink) tiles are lovely. I don’t think G ever really cared for them, but he’s a guy! The screened-in porch is one of the nicest features of this home. The front porch door was broken and needed to be replaced so we also replaced the back porch door to match. The rest was just good old-fashioned soap and water to clean the area. Then my mom came in and “staged” it with furniture from her patio at home. We want people to say, “Wow! This is so nice!” when they open that screen door! Ugh! The yard was So. Much. Work. I’m not a gardener so this project just seemed so overwhelming to me. Again, my parents saved the day. And again, I don’t have a “before” photo, but this shot gives you a sense of how overgrown the yard was. This was just the first week! We hauled more than 60 bags of yard debris to the curb and—God Bless Them—the garbage men took it ALL. Look! There’s a beautiful stone pathway underneath all of those weeds! Thank you for taking our home tour! I hope you enjoyed it. G and I have a lot of wonderful memories from our time here. We hope the home’s new owners love it and have as much fun here as we did. And thank you again to my Mom and Dad for sacrificing their summer to help us out. We would never have been able to get the work done—or make it look half this good—without your expertise and hard work. We ARE a great team! And we love you! Just beautiful! Love the Glidden vintage white. I’m inspired by your ideas and your family spirit!